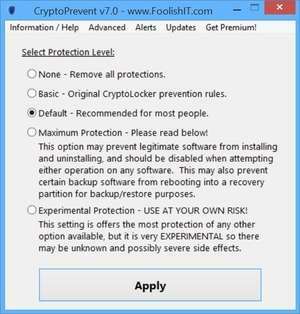 CryptoPrevent is a tiny utility to lock down any Windows OS to prevent infection by the Cryptolocker malware or ‘ransomware’, which encrypts personal files and then offers decryption for a paid ransom. CryptoPrevent artificially implants group policy objects into the registry in order to block certain executables in certain locations from running. Note that because the group policy objects are artificially created, they will not display in the Group Policy Editor on a Professional version of Windows — but rest assured they are still there! For security reasons, you should also check out the CryptoPrevent download at LO4D.com which includes virus and malware tests. Additional screenshots of this application download may be available, too.